It may seem to those of you who read my blog that I’ve been abducted by aliens, biked off a cliff, or lost the use of my fingers. None of those are true, but I HAVE been abducted by a dye pot! 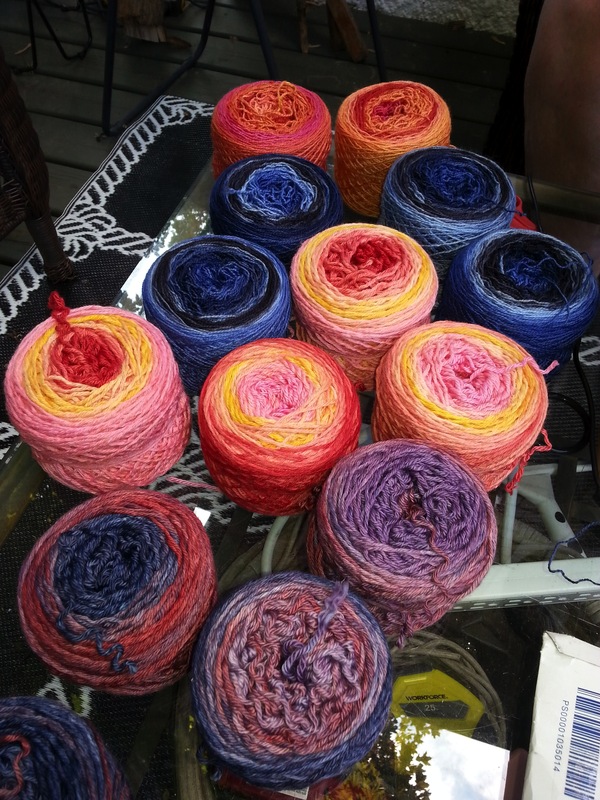 New colors, new inspirations and ESPECIALLY new ways of dyeing yarn is on the horizon. We hesitate to offer the newest items online because my personal preference is to only sell things online that I know I can duplicate (for future, follow-up orders) So in order to see our latest colors and dye methods, catch us at the fiber shows. To see a list of ModeKnit Yarn fiber shows, and where I’ll be teaching, click here. This weekend will be the final photography for my newest book (due out Spring 2015 with Stackpole Books) and I’m finishing up the patterns. It’s been a VERY fun book to work on, all of the pieces are small items, boleros & armery pieces and head-wrap/scarf types of things. Once that is out the door I’ll have MUCH more time to devote to developing pattern support (and having samples knitted) for ModeKnit Yarn. There are SO many ideas I have, I cannot wait to share them with you as this Summer stretches out before us! We’ve been toying with methods to create long gradient color changes, and I believe we’ve hit on an excellent method. But here’s a taste of what I’m dyeing up these days! That’s Spessartine, Lazurite, Mercury, Tanzanite & Ametrine, all anxious to be knit up! I think I’ve figured something out, and I’m a bit chagrined that it’s taken me so long to come to the following conclusion; my fibro is strongly affected by synthetic sweeteners. This Spring Vickie Howell expressed surprise when she saw me drinking a diet coke. Her own mom has Fibromyalgia, and the aspartame in DC is a trigger for her flare ups. I laughed it off, saying I’d never noticed a connection. And I took a long sip of my Diet Coke. The truth is, the only time I generally drink Diet Coke is when I’m traveling, on the road, and there are so many variables that when I have a flareup while I’m on a trip I hadn’t put two and two together. But this weekend was Andy (Hannah’s) graduation party, and we’d stocked up on Diet Coke for the festivities. It was also, coincidentally, one of the worst flare ups I’ve had in almost 3 years. As I was lying in bed for the 2nd straight day, not able to do much besides write in agony and play 2048 (damn you, Adina, I will best you yet!) I was befuddled as to what was the cause of this latest flare. And I sipped another Diet Coke. Was it the pressure of finishing a book, the stress of having in-laws visit and Andy’s graduation? The financial working-out of paying for college? The party? The work of dyeing? The fact I hadn’t been for a bike ride in over a week? I couldn’t put it together. As soon as I was feeling slightly better I went out for a long ride. Only instead of my regular water I took some vitamin water in my bottle, not realizing it was sweetened with a non-sugar substitute. The effect was immediate. I rode 19 miles, but I felt like hell by the time I got home. That’s NEVER happened to me—the bike is where I go to escape flare ups! And then it hit me. The common factor in both my major flare up, and my mini one on the bike was the imitation sweetener. This entry was posted in Bicycle, Current Projects, Health, MKY, My Books and tagged flow by Annie. Bookmark the permalink. I’m glad you may have found another link to the flareups. I see ModeKnit Yarn got a mention in the newest Interweave Knits magazine – that should be a boost to the business! We suspect artificial sweeteners were a contributing factor to my mother’s extreme arrhythmia that required a pacemaker and life-long coumadin taking. Diet soda’s high fructose corn syrup is also implicated in her weight gain and subsequent diabetes. Now she steers clear of them, managed to drop weight, and is generally doing much better. We seriously thought she’d never live to 70, but things changed so much she’s now 85 and the energetic caretaker of her 8 year old grandson for the past 6 and a half years. Better diet and purpose saved her life! So great when you can figure out a link like that. Aspartame is everywhere so become an avid label reader and if it seems like it might? avoid. Food “substitutes” are just a bad idea. You seem to be a frail ecosystem so treat yourself kindly and eat like the French. Aspartame gives me headaches that just plain linger and nothing touches. I avoid all those fake sugars just in case. Thank you for writing about the sweeteners and fibromyalgia. It’s a good fact to know. Every little fact is good to know when you suffer with fibromyalgia. Most importantly, I enjoy reading your blog very much. Just glad to see you’re back posting. As a longtime reader and fan, I worry when you’re gone too long. Hope avoiding aspartame helps a lot. Wow! Who would have thunk it? I hope laying off the sweeteners works for you and improves your quality of life. It sounds very promising. BTW — your yarn looks lovely. The colors — as much as I can see them on my monitor — are gorgeous and I bet they are even prettier in person. I know some people are more attracted to the feel of yarn, and while that is important to me, I’m all about the color.